One highly rated provider for AC, electrical and plumbing. Services Austin home and business owners have trusted since 1976. We are proud of the broad range of services we’ve developed since we opened our doors more than four decades ago and, more importantly, of the team that stands behind them. 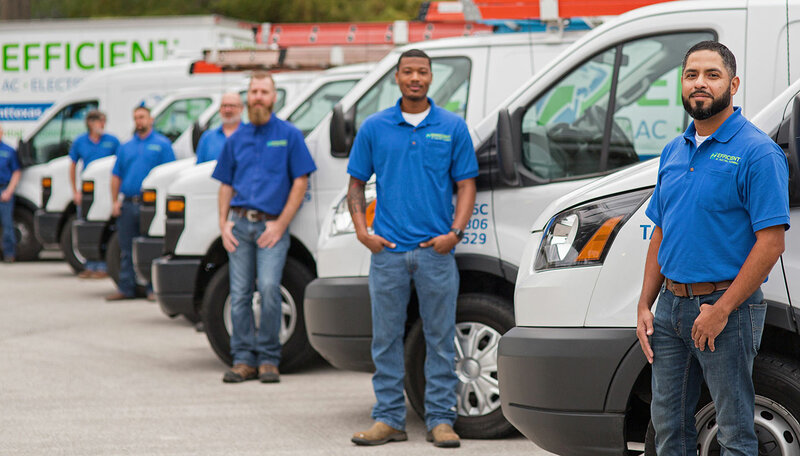 We’re proud to employ skilled AC repair technicians who are available 24/7 in the greater Austin area. Plus, we stand behind our work with a one-year warranty. Our team is experienced with replacing residential and commercial systems of all types. We provide free on-site estimates and high quality installations throughout Austin metro. From small projects to major jobs, our team of quality-driven electricians can help you achieve the safest and most aesthetically pleasing results. We handle all residential and commercial plumbing needs. Whether you have a clogged drain or need a water heater replacement, our plumbing team will provide a reliable solution. There are thousands of licensed contractors in Greater Austin. Wouldn’t it be nice to know which company you’ll call if something comes with your air conditioning, electrical or plumbing – without having to research? Since starting in 1976 as an HVAC service and construction contractor, we’ve expanded our offerings and established ourselves as a company locals can rely on for all the major systems at their homes and businesses. We do it well – but don’t just take our word for it. Read the hundreds of online reviews we’ve received for HVAC installation/repair, electrical and plumbing service. We are proud to be a six-time recipient of the Super Service Award from Angie’s List, where we have more than 800 reviews and an ‘A’ rating. We also maintain 4.5+ star ratings on both Google and Yelp. We stand behind our work with a one-year parts and labor warranty on all repairs. We’ve also been serving greater Austin for more than four decades, so you can trust we’ll be around to help with your service needs for years to come. The person we send to your home will always be a full-time employee of our company – not a subcontractor. We believe it’s in your best interest - and ours - to send someone to your home who has a vested interest in upholding our longstanding reputation for quality and service. Every AC installer, technician, electrician and plumber on our team is also required to pass a background check and initial and random drug testing. We’re a family-owned business, and we won’t send anyone to your home whom we wouldn’t want in ours. We’ll never try to sell you something you don’t need. The guiding principle of our business has always been: What’s good for our customers is good for us. We work hard to earn and keep customers’ trust, which means we’ll only recommend work that’s in your best interest. If you don’t need a repair or replacement, such as an AC system or water heater, we’re not going to try to convince you that you do. See for yourself why Austinites trust us with their homes and businesses.